This piece was originally published in the January 2017 edition of the FSA Voice. See the full edition as well as past editions. What about the implicit bias revolution? Last spring, two FSA staff took part in a Deep Diversity workshop sponsored by the BC Federation of Labour. The workshop was billed as an introduction to unconscious bias, stereotypes, and how they relate to diversity inclusion in the workplace, and it aimed to provide tools to “diminish the effects these biases have on our workplace and community.” The concept of cognitive or implicit bias became topical last fall during a U.S. presidential debate when Hillary Clinton used the term in reference to concerns about policing and the justice system’s response to the many killings of African-American men. What does this have to do with the FSA and Diversity Circles? Interest in implicit bias arose from our involvement on the Harassment and Discrimination Steering Committee, along with representatives of the BCGEU bargaining units, the BCIT Student Association and BCIT. The Institute’s recent respectful workplace training efforts have prompted deeper reflection on the nature of discrimination and how to effectively address discriminatory attitudes and conduct at BCIT. The fact is that when faced with complaints or questions about our own biases, most will say they are not racist or sexist (or other) and that they did not intend to be discriminatory. It’s also clear that negative stereotyping of individuals from minority or other out-groups is incredibly persistent. To create more inclusive and respectful workplaces that celebrate difference, we need more than directives, good policies, and sanctions. What’s called for is more thoughtful strategies and interventions because research establishes that all of us are programmed at a cognitive and usually unconscious level to be, well, biased against individuals and groups we view as different from us. Research also confirms a tendency to have less empathy for people who are perceived as dissimilar. While most of us think we are rational actors, in reality we operate under the influence of cognitive biases that distort our thinking, influence our beliefs and empathy, and sway decisions we make every day. Researchers regard cognitive biases as a genuine deficiency in our thinking and judgment. Despite the best intentions, people frequently and automatically classify information in ways that are biased, and these biases are “implicit”, meaning they’re hidden and unintentional. Most of us make split second assumptions about the value and competence of others based on differences in traits like race, gender, and gender identity. Society’s cues help to cement our biased views about “normalcy” with respect to these traits, and we’re continuously socialized to see the world in terms of in-groups and out-groups or ‘other’. All of us are susceptible to these problematic dynamics in the media and politics. However, the natural categorization of experiences and people on the basis of similarity versus difference begins in babies under a year old. In this sense, we are hard-wired to favour homogeneity over diversity. The categorization that leads to stereotyping is a normal aspect of our cognitive process. A typology of different cognitive biases has emerged. As one example, confirmation bias causes us to seek information that confirms our pre-existing views while downplaying information that threatens those views. The problem is that the implicit biases and mental constructs we carry have adverse effects on our decisions and interactions in the real world, including workplaces. Stubborn biases condition the individuals we oppose or dislike or fear, creating in-group and out-group biases that skew attitudes in ways that prejudice members of out-groups. 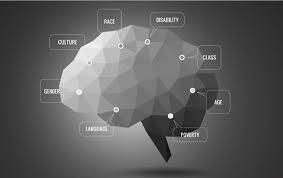 Research shows that the correlation of race with negative stereotypes operates at a neural level. Recent neural imaging studies of empathy for pain have revealed a racial in-group bias in human brain activity in response to other group members’ suffering, as compared to outgroup individuals. Alarmingly, the activation of unconscious stereotyping is easily triggered by the cognitive phenomenon known as “priming”, which operates when people view photos or read names or hear music. These triggered biases play out in decisions like the rejection of applicants for job interviews based on the ethnic origin of their names. Studies confirm unintentional bias and stereotypes amongst healthcare providers: stereotyping based on race, gender and other traits influences their interpretation of behaviour and symptoms and influences clinical decisions, leading to disparities such as in the administration of pain treatment as between in-groups and out-groups. There is evidence within the U.S. criminal justice system of harsher sentencing and differential weighing of evidence based on traits like race. Interestingly, both men and women harbour particular stereotyped traits of leadership that are commonly associated with males with implications for the evaluation of candidates for leadership positions. In job competitions, women are as likely as men to choose male candidates over female candidates who are similarly or better qualified. The brain’s quick computing of these constructs affects our judgment of candidates for leadership, leading to less gender diversity. These biases are powerful and natural, and where subtle and unconscious, they are highly resistant to change. So how can institutions hope to alter these habits of the mind? Until recently, discussion of implicit biases was rare. This emerging understanding of our shared frailty in judgment has been dubbed the “implicit bias revolution.” Parallel to the growth in understanding of the significant consequences of the operation of implicit bias on decisions by those in positions of authority, there is also a better understanding of how to address implicit biases. Greater self-awareness can be cultivated through thoughtful exercises and skill-building that motivates change and works to cultivate empathy and interrupt the link between past experience and impulsive responses. Such interventions have been shown to reduce patient treatment bias, for example. The recognition that we are all subject to these implicit biases that need to be re-coded is proving to be key to approaching this challenge in a more informed and open way. This framing creates opportunities for change that don’t exist when shaming and other punitive exercises are employed. Taking a page from Diversity Circles and the FSA’s value of fostering solidarity, it’s incumbent on us to get serious about promoting equitable, discrimination-free workplaces. Until we face our implicit biases, harmful attitudes and actions will continue to perpetuate in workplaces and other spaces where not everyone feels included and equal, much less appreciated for who they are and the gifts they bring.